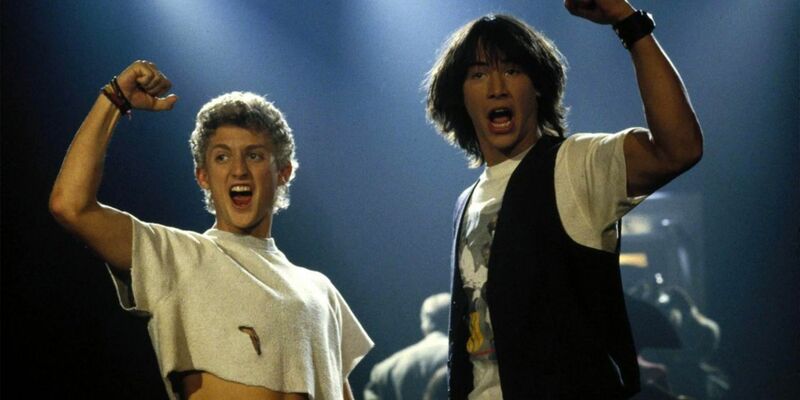 The co-writer of Bill and Ted 3 has dropped some more details about the existing script, and has explained just why it's taking so long to see Keanu Reeves and Alex Winter reprise their much-loved roles as the history-saving slackers. Screenwriter Ed Solomon, along with co-creator Chris Matheson, wrote the original Bill & Ted's Excellent Adventure back in 1989 as well as Bill & Ted's Bogus Journey in 1991. The ingredients are all in place for the next installment but it's still looking for finance and distribution. Bill & Ted's Excellent Adventure introduced the world to Bill S. Preston (Winter) and Ted 'Theodore' Logan (Reeves), two lovable idiots who were destined to usher in a new age of prosperity and peace for Earth... if only they could pass their history exam. With the aid of future-born mentor Rufus (comedian George Carlin) and a time machine, they eventually achieved their aim. Bill & Ted's Bogus Journey saw them literally beat Death (William Sadler) and defeat their robot doubles. Although now seen as cult movies and classic comedies, they weren't huge money spinners at the time. Nevertheless Solomon and Matheson have been working on a script for a third film in the franchise which was reportedly completed in 2011. Since then there have been periodic updates on the project, with both Winter and Reeves attached and providing support, and Galaxy Quest director Dean Parisot tapped to shoot it. "We have a script that we really are proud of, that we worked very hard on, that we've done many iterations of – and we did it on spec, meaning we spent years working on it because we wanted to get it right, creatively. This is not, 'Hey let's all cash-in on the Bill & Ted thing for money' – this is the opposite. This is, 'We love these characters, they've been with us for our whole lives' – Chris and me, and Alex and Keanu – and we wanted to visit them again as middle-aged men. We thought it would be really fun, and funny, and sweet." While it was generally known that the plot would feature middle-aged versions of Bill and Ted, Solomon also reveals that Rufus will be an important part of the plot, despite the passing of Carlin in 2008. The writer said that the story will be partly an homage to the actor/comedian, and his absence will be addressed directly in the film. The storyline will involve time-travel again, and Solomon has written a scene where Bill & Ted will journey back to the Circle K shop from the first film, and see their younger selves in the classic moment which will be visually manipulated to include the older versions. With the stars and a director in place, Solomon says that the only real issues are convincing financiers to invest and to resist the constant calls from studios to reboot the concept with a new cast. Happily the writers are totally against that approach and will only proceed if their version of the script goes ahead, with the original 'Wyld Stallyns' now living as aging family men with kids. Hopefully, the film will finally be given the green-light sooner than later. More updates on Bill & Ted 3 as we get them.